Is Your Bird Experiencing Feather Loss? Naturally this very supportive group assured her it was normal and didn’t give her a hard time.They explained the process of molting to her. She certainly felt a lot better after they explained the process to her and all was well. If you have a baby bird in the house and their feathers are growing, you might find your home’s floor and the enclosure you keep you bird in littered with bits of keratin. This is the feather sheath that has been burst open by the emerging feather. It looks like quite a bit of keratin but it's perfectly normal when you consider that your baby bird is growing in an entire brand new set of feathers. So you might find yourself sweeping and vacuuming more often. Birds molting their feathers is a normal process in nature. If you think about it, human beings shed their hair all of the time. Hair falls out or is pulled out in the process of brushing or combing it and it is replaced with fresh strands of hair that continue to grow. This “molting process” in humans or shedding in other animals is just the system replacing older hair with new hair. In the day-to-day life of a bird, feathers get damaged. They cannot be repaired or heal themselves as feathers are made from a protein called keratin which is a protein. Your fingernails are pretty much made up of the same protein. Replacing these feathers which is called molting happens in response to seasonal changes and the hormones they produce. And when does this happen? People who live in warmer areas report that it seems that there is a constant molt going on to a degree, but because it takes a lot of energy to produce and replace these feathers, it usually occurs in less stressful and strenuous times when it’s easier for their systems to replace the feathers. In the wild, this typically occurs right after nesting season or just before migration. But parrots for the most part simply replace a few feathers at a time when needed. This is to ensure that the parrot can still take flight. In the wild, if a bird cannot fly he will be in danger. Flight is absolutely crucial in avoiding predators and it is probably their best defense mechanism. 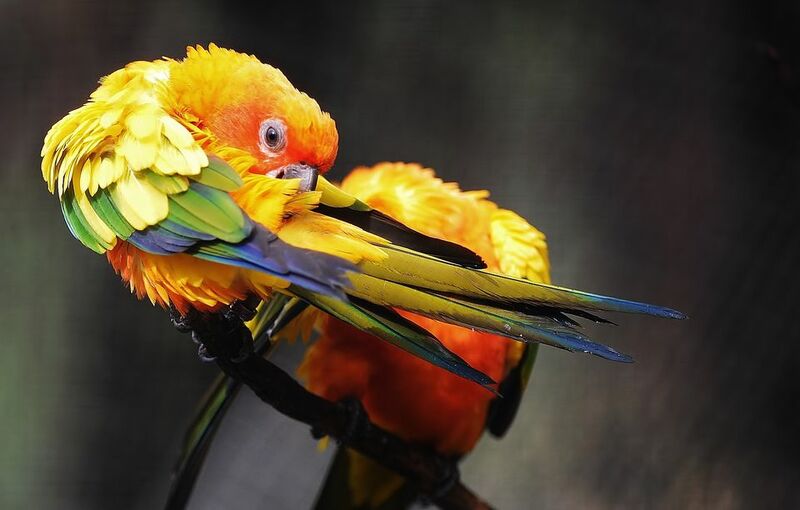 You may find your parrot preening a bit more during a molt or if you have two that are a bonded pair or are simply friends, they may choose to help each other out with stubborn keratin sheaths surrounding the feather. They pick at the sheath to release the feather from its protective sheath. Molting is an itchy experience. When those sheaths come in full of the feathers, you might observe your bird picking at his feathers or scratching at those hard to reach spots such as his head or neck. This action releases those feathers and makes it easier for them to develop. It also makes the bird less itchy. Showers are also beneficial in alleviating the itching. It also softens the keratin making the feathers easier to burst through that sheath. Many birds don’t mind a little bit of head scratching to help release those feathers form their keratin sheaths. But some birds may find it painful or uncomfortable. There are some things you can do to assist with this molting process. Because the feathers and sheaths are made up of protein, you might want to ensure they get a dietary increase of good proteins during a molt. Introducing them to a little scrambled egg or adding a few cooked beans into their Chop or Grain Bake might make the process a little easier on their system. You may want to check with your avian vet regarding their diet to see what they suggest to help with the molting. And of course any dietary changes should be checked out by your avian veterinarian as well. How, rest assured this molting process and the occasional loss of a feather is a completely normal process in nature. However, if you see an unusual excess of feathers, please consult with an avian veterinarian to see if there is a health problem that might be causing the excessive loss. How Bad is Your Bird Bite Wound? Does Your Pet Bird Need to Gain Weight?